Pharmatech: Free Download of Ansel's Pharmaceutical Dosage Forms and Drug Delivery Systems pdf Book (Ninth Edition). Edited By Loyd V. Allen, Jr.; Nicholas G. Popovich and Howard C. Ansel. 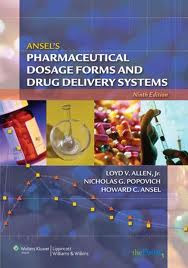 Free Download of Ansel's Pharmaceutical Dosage Forms and Drug Delivery Systems (Ninth Edition). Edited By Loyd V. Allen, Jr.; Nicholas G. Poppvich and Howard C. Ansel. Note: Update version of Adobe Reader is needed to read this Book.